An emergency card can be a quick and effective way to let healthcare professionals know that you have a diagnosis of HAE when you arrive at a hospital or care center, and the treatment that should be considered. 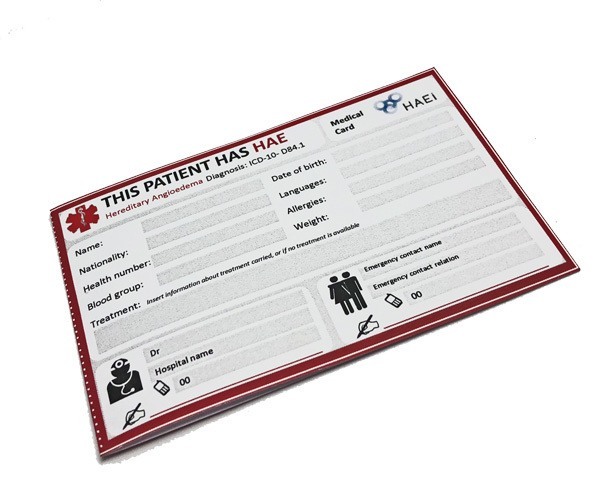 The HAEi Regional Patient Advocates have developed a template Emergency Card, which contains clear and simple information about HAE and treatment required during an attack. It also contains space for patients to add personal information such as emergency contact details and their specialist treatment center. The Emergency Card has been translated into a number of languages and is already being used by HAE advocacy organizations around the world. On the HAEi website, you can find examples of these cards for you to download and use. Each card has been designed to be printed at home, cut out and folded in half to create a format that can fit within a wallet/purse. The Emergency Card has been designed to be used by HAE patients from all countries and can be adapted by any HAEi member organization. If you are a member organization and have designed your own emergency card that could be displayed on the HAEi website, or if you would like help from HAEi in adapting a card, please contact Project Manager Deborah Corcoran at d.corcoran@haei.org. If you are not a patient or part of an HAEi member organization and would like to use one of the cards, please contact the HAEi Regional Patient Advocate for your area and inform him or her that you plan to use the card. HAEi Regional Patient Advocates’ contacts can be found at www.haei.org/organization/meet-the-rpas. Currently, the Emergency Card exists in 10+ languages – and more are to be added.